Further along the coast is this sandy spot where a number of coral reef balls have been placed to promote growth. There is quite an impressive array of fishlife here with angelfish, pipefish, mandarinfish and leaffish. Careful inspection of of sponges and general rubble can reveal frogfish and other critters. A little way along are the house reefs of Tasik Ria and Lumba Lumba where good hard coral growth can be found. 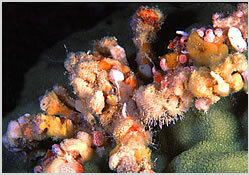 Lobsters often forage between the rocky outcrops and ghost pipefish can be found on close inspection.